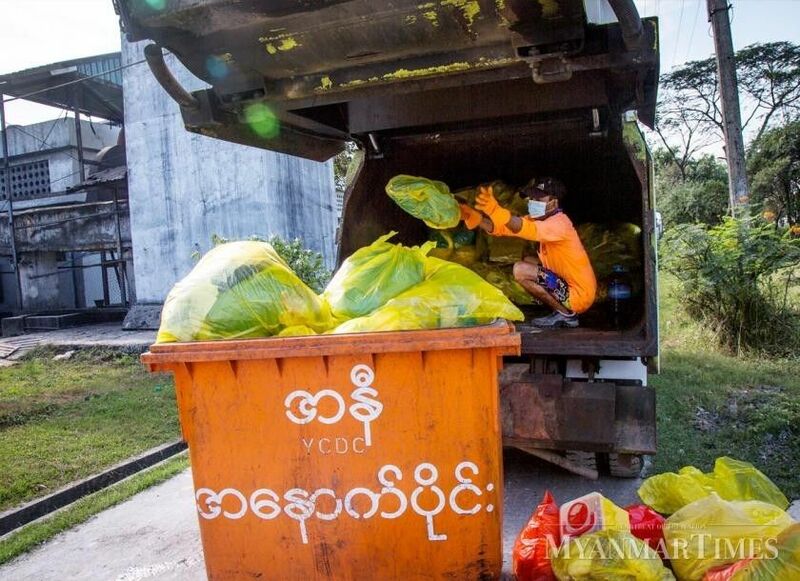 09 April 19 - Source: Myanmar Times - At 6pm each day, Ko Aung Si Thu, an employee of the Yangon City Development Committee (YCDC), starts collecting garbage on Anawrahta street in Pazundaung township. He works until 6am the next day. While making his rounds, he often finds potentially dangerous waste discarded by hospitals in the area. The city and the Ministry of Health and Sports have specified that dangerous waste is not allowed to be disposed of in bins on the street but only in special trucks. Every three or four days, Ko Aung Si Thu finds hospital waste in the bins, including disposable needles and syringes, used hospital gloves and blood-transfusion tubes, so he has to handle them carefully. Sometimes, he finds discarded needles and syringes in old water bottles. Luckily, his superiors have briefed him in detail on handling such dangerous articles and arranged for him to have vaccinations. The city's Department of Pollution Control and Cleansing also issues him gloves and masks to protect him from disease. Despite instructions from the YCDC to dispose of dangerous waste after separating it into different coloured bags, some hospitals and clinics disregard the rules. U Aung Myint Maw, deputy head of the department, said clinics and hospitals still tend to lump all their waste together. "Although I don't have a list of the hospitals that dispose of dangerous waste carelessly, I can say that most of them do it," he said. Yangon Region's 71 hospitals and about 4000 poly clinics dispose of nearly three tonnes of harmful waste a day, according to the YCDC. They have been instructed to sterilise dangerous waste before discarding because failure to do so invites infectious diseases, health experts and department officials said. "It is high time to change the bad habits of public and private hospitals when disposing of waste and water," Dr Khin Maung Lwin, former director of the ministry, said. Waste from hospitals and clinics categorised as harmful to humans includes infectious waste (blood and blood products, fluids, waste from autopsies and human waste), sharp objects (syringes, blades), chemicals, pharmaceutical waste, pathological waste (human tissue, laboratory samples), human body parts, and radioactive waste. For hospitals and clinics, the city specifies that waste be separated into green or blue plastic bags for kitchen waste, yellow bags for infectious waste, and red bags for sharp objects. Kitchen waste can be disposed at rubbish tips, but the city has instructed that infectious and sharp waste only be disposed of in its garbage trucks. Since 2016, the city garbage trucks have had separate compartments for infectious waste and sharp objects. Nine garbage trucks collect harmful waste from hospitals and clinics in Yangon each day. Infectious waste is transported to Htein Pin cemetery and destroyed in the crematorium, while the sharp objects are buried. Hospitals have to seek permission from their township health department doctor and municipal department to dispose of human body parts in cemeteries. Daw Wah Wah Myo Aung, deputy director of the department, said, "If we dispose of expired radioactive materials, we have to send them back to their original countries via the companies from which we bought them. The department issues a transport certificate only after experts from the Department of Atomic Energy check the materials for safety." Yangon General Hospital produces about 1.5 tonnes of hazardous waste each week. Dr Khin Maung Gyi, assistant director of the hospital, said it separates the waste into seven different groups, sanitises it, and disposes of it by contacting the city. Blood, pus and used tissues from operating rooms are defined as hazardous and must be separated from other trash in municipal garbage trucks, city employees said. They said the Department of Radiology and Atomic Energy stores used syringes and waste in lead-lined containers in a "hot lab" for three months before disposing of them when it is sure there is no more danger. Dr Tin Min, medical director of Victoria Hospital, which is privately run, said hazardous waste produced by the hospital is disposed of according to city regulations. It uses safety boxes for sharp objects to protect garbage collectors, sanitises liquid waste, and disposes of radioactive materials according to department instructions, he said. Research of waste management at 20 public hospitals, 20 private hospitals and three workers' hospitals in Yangon Region in 2017 by the Hospital Administration Society and the Myanmar Medical Association, found that some hospitals do not separate waste into the specified coloured bags and cleaners do not wear safety equipment to protect themselves from infection. The ministry's Medical Services Department directed every hospital to organise Contagious Disease Control and Prevention teams administered by the Private Health Care Department. There has been no major damage to people's health from hospital waste, department director Dr Kyaw Swar Lwin said. Since 2015 and 2016, there have been fewer incidents of severed limbs and dead foetuses being disposed of in city rubbish tips and bins, said city officials. However, waste water from clinics and hospitals is being directly dumped into city sewers without sterilisation, which could spread contagious diseases, said city officials and health experts. If drug-resistant germs and viruses are disposed of by hospitals without sanitation and they spread among the public, they can be very hard to cure. "Unused medicine included among the waste is also dangerous," warned Dr Khin Maung Lwin. When hospitals and clinics apply for licenses, the Department of Medical Services and Private Health Care Department examine how they store and dispose of infectious waste, sharp objects, chemicals, and other dangerous waste. The Private Healthcare Services Law issued in April 2017 set standards for hospitals to prevent environmental pollution, the spread of infectious disease, and to ensure the safe disposal of waste. Hospitals and clinics that fail to follow the law are reported to the regional or state supervisory committee. When private hospitals and clinics apply for or extend their licenses, the YCDC scrutinises how they clean waste water from their operating rooms and laboratories and dispose of dangerous waste. A city law passed last June stipulated that hospitals in metropolitan areas must dispose of hospital waste and human body parts according to the regulations of the committee. Violators face six months in prison, a fine of K300,000 to K1 million, or both. So far no cases have been tried under the law, officials said. Hospitals in rural areas have difficulties disposing of dead bodies because local cemeteries have no crematoriums and do not accept the bodies, said Dr Htin Paw, president of the Myanmar Private Hospital Association. 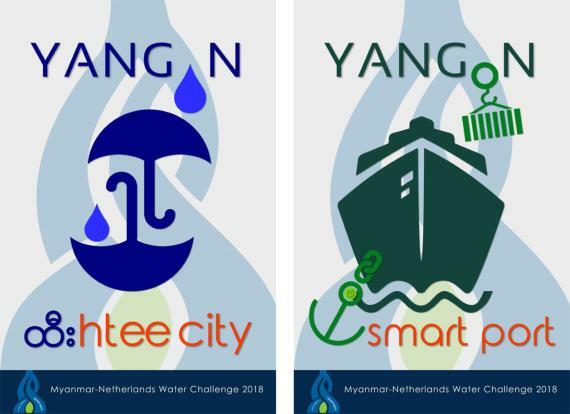 "The standard followed in Yangon cannot be applied in remote areas. Officials need to take this into account," he said. Officials are responsible for raising awareness among staff of the safe disposal of hazardous waste, and should conduct occasional inspections to make sure they follow the rules, Dr Htin Paw said. Since 2012, the Hospital Administration Board has sponsored training by senior doctors of 514 people in the safe handling of hazardous medical waste at hospitals, officials said. The production of hospital waste is on the rise in Yangon. It will be classified and charged different prices according to its type, and a bar code system will be introduced by the city at the end of this year. An incinerator is being built near Htein Pin cemetery that will be able to burn 20 tonnes of medical waste a day and will be put into operation this year, said U Aung Myint Maw. "All types of waste will be collected through the bar code system. They will be scanned first, then taken to the dump. The incinerator will be able to burn both sharp and pathological waste," he said. In addition, an On Call system will be introduced for hospitals that produce large amounts of waste. "As hospital waste is hazardous to both people and the environment, it should be safely and systematically collected, or hospitals could become places that spread disease," Victoria Hospital's Dr Tin Min said.